Day 1 went pretty well, the sun was out and there was a cool breeze so no one got overheated. We stuck to kettlebell fundamentals - swings, clean & press, lunges with press, swing flip squat, around the body, and stall - giving everyone an opportunity to get used to the new environment. I also threw in some bodyweight exercises - jogs up the hill, mountain climbers (up the hill), burpees (of course), and push ups. It was a pretty varied workout as I wanted to get a few different things in for the first class just to see what it was like doing it on the grass. I got some good feedback at the end of the class which makes me pretty happy and really excited to plan for Day 2! The snow can't stop us! 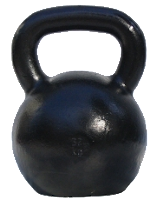 What the heck is a "kettlebell"? Can't wait to be on the Hill!